Rebuilding isn’t supposed to go like this. Rebuilding teams aren’t supposed to make it to the ALCS in what was supposed to be a rebuilding year. Yet, here the “rebuilding” Yankees are, one year removed from missing the playoffs, in the American League Championship Series for the first time since 2012 where they were swept by the Detroit Tigers. Hoping for a much different outcome this time, the Yankees will have to go through the Houston Astros who are making their first appearance here since 2005. 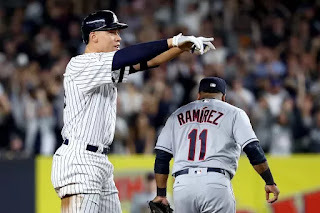 After taking down the reigning AL champion Indians, the Yankees must now take down this Astros team who also won over 100 games and who made somewhat light work of a very solid Boston Red Sox team behind many hot bats, including the hot bat of AL MVP hopeful Jose Altuve. The Astros also beat the Yankees in five of the seven times they played this season, so winning this series will be no easy task, but with an insane amount of momentum and nothing to lose, the Yankees have a legitimate shot to move on to the 2017 Fall Classic. The former Yankee ace will take the hill for the Yankees in game one of the ALCS as he looks to continue to build off of his game three gem. Tanaka looked special in game three, as he gave up just three hits and one walk through his seven innings of work. Tanaka was able to snap the Indians’ 39 game streak of not being shutout through the first six innings, an impressive feat which shows just how good he was against an insanely talented Cleveland squad. This Astros squad will prove tough as well, with hitters like Jose Altuve and Alex Bregman having insane pop which could knock Tanaka out early if he isn’t on his game. Tanaka has been much worse on the road this season, a worrying and possibly detrimental trend. If he shows up like game three though and gets the game to the bullpen with little damage done, it’ll be all up to the offense. On the hill for the Astros will be the daunting Dallas Keuchel. The 2015 AL Cy Young had a very solid season for Houston this season and bested the Yankees in his one start against New York this season, pitching six innings with one unearned run while striking out nine. Keuchel had a similar performance in his one playoff appearance against the Yankees in the 2015 wild card game, shutting out the Yankees through six innings with seven strikeouts. Keuchel was unable to last six innings in his one ALDS start, but he still managed to hold the Red Sox to just one run through 5 ⅔ innings. If Keuchel is pitching like he’s capable, this will be a very tough matchup for the Yankees offense. Luis Severino proved himself in game four of the ALDS, redeeming himself from his Wild Card blunders by pitching fantastically in game four to force the series back to Cleveland. Severino racked up nine K’s and allowed only three runs through seven innings of work. Severino will need to continue to perform like such in this series for the Yankees to have a shot. Severino has been the Yankees best pitcher all season and will called upon to pitch like an ace. Unfortunately, Severino struggled against Houston this season, allowing three runs in just 2 ⅓ innings of work in his first start, and allowing six runs in just 5 ⅓ innings of work in his second start. Thankfully though, those starts were in May and July and Severino looked like a brand new pitcher in game three and should look to keep his momentum going into this game. As for the Astros, Verlander will take the mound and look to continue his excellent run with Houston so far. In game one of the ALDS, Verlander allowed just two runs on six hits through six innings while also racking up three strikeouts. With just a 1.06 ERA through five starts with Houston, Verlander has certainly been on a roll lately and will not look to slow down in game two. Verlander has yet to get a look at this Yankees squad though, so he may be in for a surprise and may make a few missteps pitching to the potent lineup. It’ll be up to the Yankees to capitalize if he does. Although the Astros only have their pitchers for games one and two announced, the Yankees have their first four announced, and game three will be started by one of the heroes of ALDS game five, CC Sabathia. Sabathia has the same amount of playoff experience as the amount of dirt he ripped up from the area right in front of the pitchers mound on his athletic slide in game five, a lot. 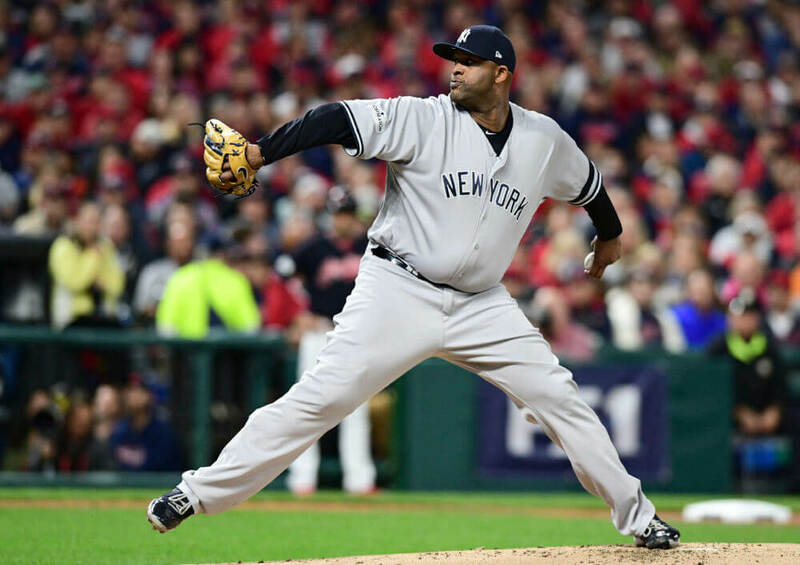 Sabathia is coming into this start after a really solid ALDS start and will be tasked with giving the Yankees a 3-0 lead, preventing an Astros 3-0 lead, or sending the Yankees into game four up 2-1. If he carries over his strikeout ability from game five, he should be just fine. Gray has been off in his last two starts, lacking control and most recently allowing three runs, four walks, and three hits to the Indians in his short starting stint. The Yankees will need him to turn things around for his game four start though, as the Astros will thrive against him if he doesn’t shape up. This game could be do or die for the Yankees in the worst case scenario, and Gray pitching like he has recently would be horrible for the Yankees comeback chances. If the Yankees are on the verge of a sweep, in the best case scenario, Gray will be needed to close out an Astros team which can grab momentum and run with it. However, no matter what the series is at, Gray has to be better. If necessary, the Yankees will likely put this start in Tanaka’s hands, a game which could be either be highly pivotal or series deciding. This start would no doubt be high pressure for Tanaka, pressure which Girardi would be relying on him to thrive under. Thankfully, this start would be at Yankee Stadium, as Tanaka has been much better at home this season. 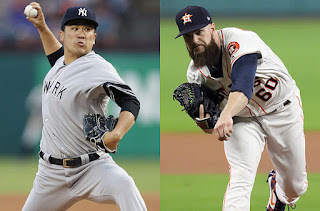 Whether the series is 3-1 in either team’s favor or tied at two games a piece, Tanaka should look to use this game to give Yankees some momentum heading back to Houston or heading to the Fall Classic. If necessary, Luis Severino would likely get the game six start, a game which could either send the Yankees to the World Series, or be necessary to win to force one final game in the series. This situation would be very similar to game four of the ALDS where Severino thrived and pitched like the ace he’s been all season (ignoring the Wild Card game). Severino would be a perfect fit for this role, so look for Girardi to turn to him if a game six comes around. In a winner takes all game seven, the ball will likely be put in the hands of none other than CC Sabathia, the Yankee veteran with immense experience in high pressure situations who recently thrived in a series deciding game five in the ALDS. Sabathia will have received plenty of rest prior to this start after what was hopefully a gem in game three. Seeing anyone other than the big man on the mound for such a crucial game would be strange, so expect Sabathia to get the start if the series comes to an intense game seven climax in Houston. The ALDS was not kind at all to Aaron Judge, as he imploded with strikeouts, as he had three four strikeout games in the five game series and set the all time record for strikeouts in a playoff series, and it was only a five game series. Thankfully, he did show some flashes of his MVP caliber play in the series, including his two run double in game 4 and his series saving leap to rob Francisco Lindor of a home run and keep the game scoreless in game 3. However, he has to be much better in this series if the Yankees want a chance of continuing their playoff run. 1 for 20 with 16 strikeouts won’t do it this series. Judge has said he’s capable of turning the page and having a completely different series in the ALCS, let’s see if he’s got what it takes. Tanaka had a major down season this year, as he lost his ace role and had major issues all season with getting late into ballgames and providing quality starts for the Yankees. However, all is forgiven after his ALDS game three gem which was the spark for the Yankees miraculous 3-2 series win over the Indians. Although the game five starter, if necessary, has yet to be announced, it could very likely be Tanaka. If the series reaches game five tied 2-2, Tanaka’s start will be crucial to taking a lead into hostile Houston for game six. Going back to Houston down 3-2 would be detrimental to the Yankees’ World Series aspirations. Tanaka’s game one start will also be very important in setting the tone for the series, and stealing an early game in Houston could be huge. The Yankees aren’t the only team going into the series with an MVP candidate on the roster. Altuve was unstoppable in the regular season and was neck and neck with Judge in the AL MVP race all season. Unlike Judge though, Altuve didn’t have a rough ALDS and instead had a phenomenal one, hitting 8-15, and racking up three solo home runs in a single game in game one. Altuve’s ability to rack up hits and surprising power will be a large obstacle for the Yankees pitching staff, and if they are unable to halt his momentum, this series might not last long and will result in Houston reaching the World Series. If the Yankees pitchers can slow Altuve though, it’ll be huge. The former Detroit Tiger and AL Cy Young had a strong start in game one of the ALDS against the potent Boston Red Sox offense, allowing only two runs over six innings before handing it over to the bullpen. Although Verlander isn’t what he used to be, he’s still an experienced veteran pitcher who the Yankees may have to face twice this series if the game goes past four games. In the regular season with Houston, Verlander had 5-0 and a 1.06 ERA which are very scary numbers. This could prove an issue for a Yankees offense which struggled against the Indians pitching staff most of the series. However, the Yankees’ ability to hit Kluber in the ALDS is very promising and could be a good omen, as if the Yankees can hit off of the likely AL Cy Young, they should be able to hit off of Verlander. The Yankees will have to try and get to him early, or his starts could mean long nights for the Yankees offense. This ALCS is looking to be a thriller. In a matchup of two high powered offenses, including the two leading AL MVP candidates, don’t expect many pitching duels despite the large amount of talent among these pitching staffs. Both teams come into this series as young teams with not much playoff experience and very bright futures. This will be a very tough matchup for the Yankees, yet, as shown by the ALDS, nothing is impossible. If the Yankees can get some solid starts out of the starting pitching staff and some pop out of an offense which has a plethora of it. This rebuilding year may just turn into the Yankees representing the American League in the World Series, a thought which would’ve been quickly dismissed months ago at the start of the season. This isn’t the same Yankees team though, this team is the real deal and is marching into Houston with all the momentum in the world and a young squad which is hungry for success. This squad has nothing to lose, and expect the bombers to leave it all on the field in their relentless pursuit of 28.